S. Courtney Walton is the founder of African-American Unschooling, a growing network of African-American homeschoolers and the Editor of FUNgasa: Free Oneself! The Magazine for African-American Home Educators. Ms. Walton writes frequently about her family's unschooling adventures in her column, "Real Living...Real Learning" and serves as the Unschooling Advisor for the National African-American Homeschoolers Alliance. She has granted numerous interviews about unschooling and homeschooling with journalists and educators, including The Chicago Tribune, The Baltimore Sun, The Christian Post, The Arizona Republic, the Anthropology Department at the Universtiy of Pennsylvania, and the Educational Psychology Department at the University of Georgia. This web site would not be posssible without the love and support of my family, and the encouragement from African-American Homeschoolers I'm privileged to have met via the Internet. Thank you and God Bless! 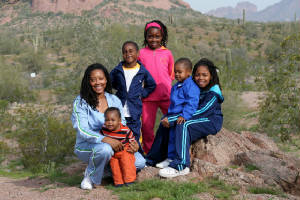 African-American Unschooling, the web site, debuted on the World Wide Web in October, 2003. This web site, along with FUNgasa: Free Oneself! The Magazine for African-American Home Educators and two on-line support groups for unschooling parents and teens, provides encouragement and resources for African-American Homeschoolers with an Africentric approach to learning all the time. For more information or to send books and products for review, please contact the editor. One of the most challenging aspects of homeschooling in these United States is finding a network of support from others who share your vision of raising spiritually whole and healthy African-American children. Conservative figures estimate that African Americans make up 5-10% of the general homeschooling population. This web site and the companion support groups, serves to meet the needs of families striving to raise spiritually whole and healthy African-American children. All material contained on this web site is copyrighted and all rights are reserved. Please do not reprint or otherwise distribute this material without specific permission. Do you have a web site? Web Masters click here!